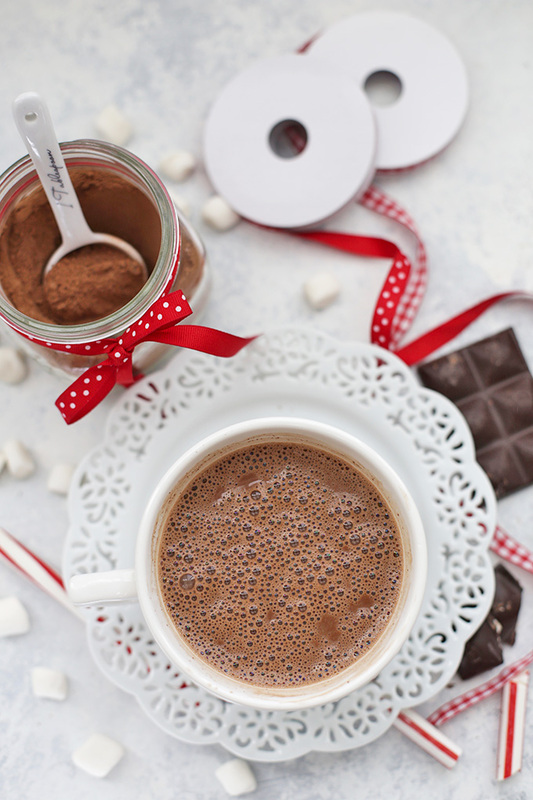 Vegan Hot Chocolate – This paleo or vegan hot chocolate is a healthier take on a cozy classic. Naturally sweetened, dairy free, and downright delicious! Scroll down for FULL RECIPE + VIDEO! The weather is chilly, and I’m craving all kinds of warm, cozy dishes. 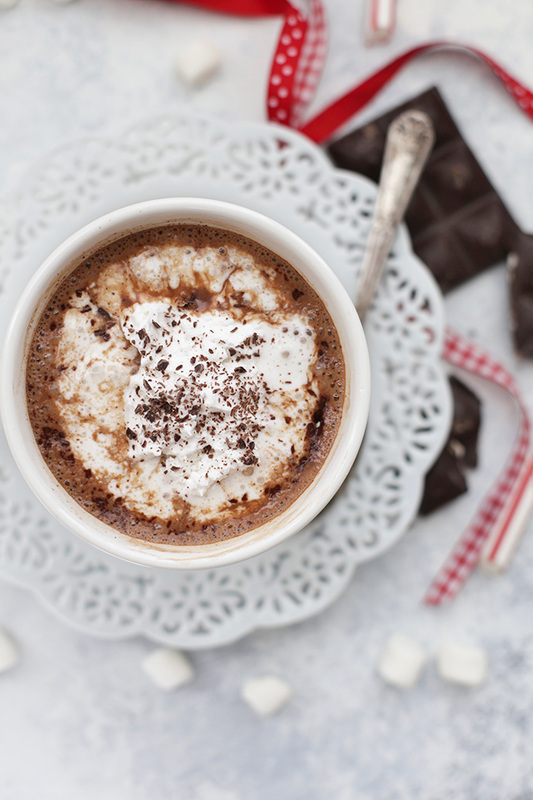 Soups, stews, and plenty of hot chocolate are all at the top of the list. 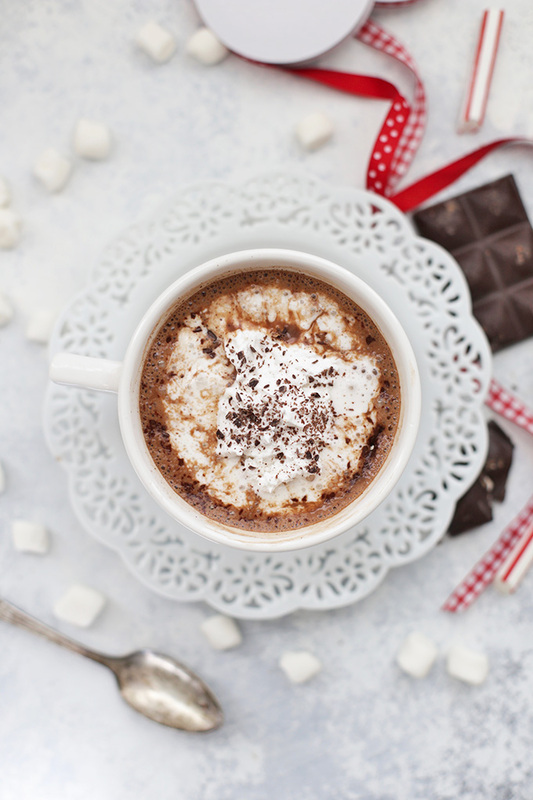 It can be so hard to find a good dairy free hot chocolate, and I’ve been testing recipes for the last few months to come up with a version I love. This paleo or vegan hot chocolate is IT. It’s chocolatey and rich without being too heavy, and uses better-for-you ingredients. Let’s make some! 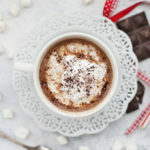 Chocolate vs. Cocoa – I tried making hot cocoa (using only cocoa powder) and hot chocolate (using only chocolate), but neither seemed to hit just the right notes for me. Since dairy free milks tend to be on the thin side and I wasn’t going to be using any kind of powdered milk for a thickener, I ended up striking a delicious balance by combining the two. A little sweetness – As for sweetener, there’s some sugar in the vegan chocolate chips I use (you could certainly use stevia-sweetened chocolate chips or a lower sugar dark chocolate bar), but the only sweetener I added to the mix is coconut sugar. Coconut sugar is believed to score lower on the glycemic index, which means it won’t impact your blood sugar as quickly (which means no big spikes and drops in energy). When I’m just making this for myself, I add less sugar since I like it a little darker and richer, but the amount listed below is perfect for the rest of my family and is great for gift giving. I love that you can toss everything into the blender to grind it and store it in an airtight container for up to 1 month at room temperature (more like 2 months in the refrigerator). If I’m making this for my family, I’ll make a half batch, add the milk right to the blender and puree it all together. You can easily double, triple, or quadruple this recipe for gift giving, or so you have a batch on hand at all times (basically an essential in the cold months). Orange: add a tiny bit of orange zest to your mix (a little goes a long way, so start small and more as desired). Peppermint: Add 1 drop of food grade peppermint essential oil to your mix, or a few drops of peppermint extract to your cup. Salted Caramel: Add a drizzle of vegan caramel and a pinch of salt to your cup. Dark Chocolate: Either use less sugar (my preference), or substitute dark chocolate for the semi-sweet chocolate chips. Mexican Chocolate: add 1 tsp cinnamon to your dry mix or a pinch to each cup. I love topping ours with marshmallows (these ones and Trader Joe’s are vegan), a little coconut whipped cream (homemade or store-bought), crushed candy canes (these ones are dye free! ), natural peppermint sticks (I find them at World Market or Sprouts), or a little grated chocolate. 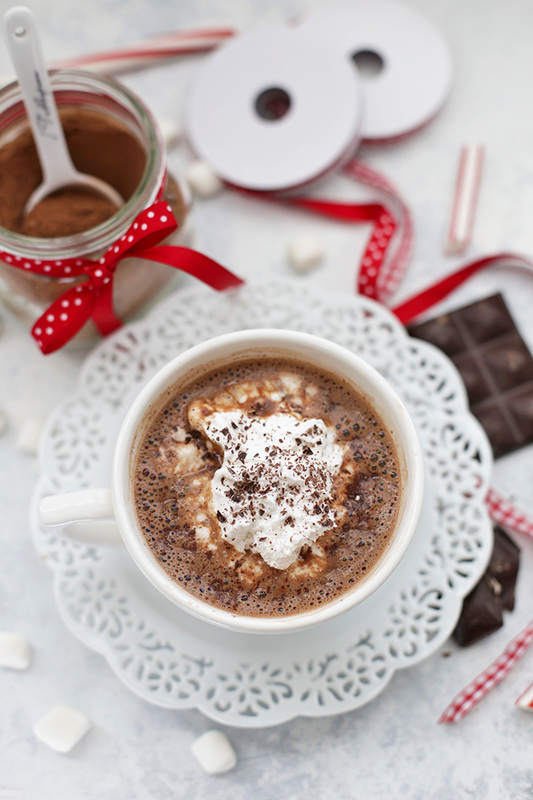 I hope this vegan hot chocolate brings as much chocolatey joy to your family as it has ours! Vanilla Powder? I often use vanilla powder in this recipe to make it shelf stable and to avoid clumping in my dry mix. I realize that vanilla powder isn’t a staple ingredient in most houses, so I’ve tried this a few ways. You can scrape out a vanilla bean and add it to your dry mix instead. Or, if you prefer using vanilla extract, just add a few drops every time you mix up a cup rather than adding it to your dry mix. I’ve made it all three ways, and it’s delicious every single way. How long will it keep? 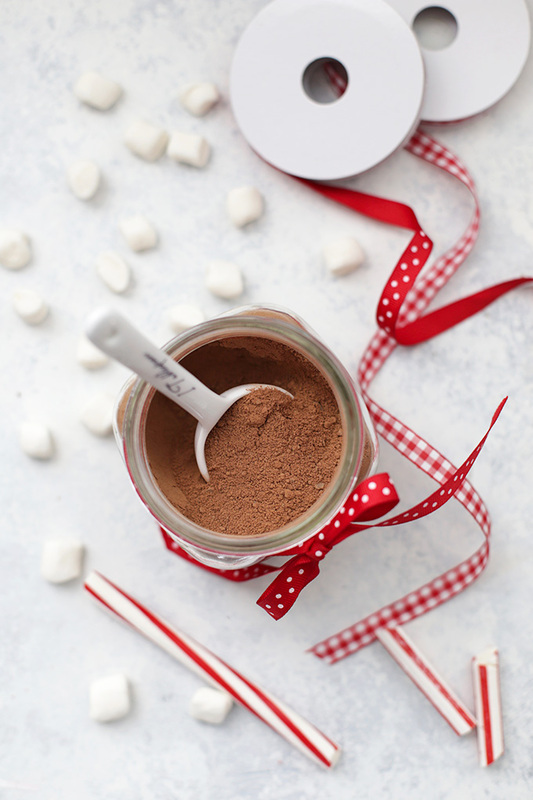 In an airtight jar or container, this vegan hot chocolate mix will stay good for up to 1 month unrefrigerated and about 2 months refrigerated. If you’ve added vanilla extract to your dry mix, you’ll need to keep it in the refrigerator and use it within a month. What kind of milk should I use? First off: USE MILK, NOT WATER. This distributes better and tastes better in milk. Water will basically make watery chocolate. Not delicious. Second, you can use any kind you like! I’ve tried it in almond, cashew, and coconut milk. I prefer almond or cashew because the flavor is more neutral, but use what you like. I feel confident that you could add it to soy, rice, or dairy milk without any trouble. How do I make a serving? Simple! Add 1 1/2 to 2 Tablespoons of the dry mix and combine with 8-10oz of milk. Heat (on the stove or in the microwave) and stir or whisk until completely dissolved and melted. Then, top with your favorite toppings! For my non-vegan friends, I love adding a bit of collagen powder for added protein. You can’t taste it and it’s the best tasting “protein drink” I’ve ever had! What chocolate should I use? I use Enjoy Life chocolate chips (vegan and allergy free), but you can use whatever chocolate chips you prefer. The amount of sugar listed is based on semi-sweet chocolate. If you like yours sweeter, you can add more sugar, or use lower percentage of chocolate (70-80% cocoa is less sweet than 50-60%). 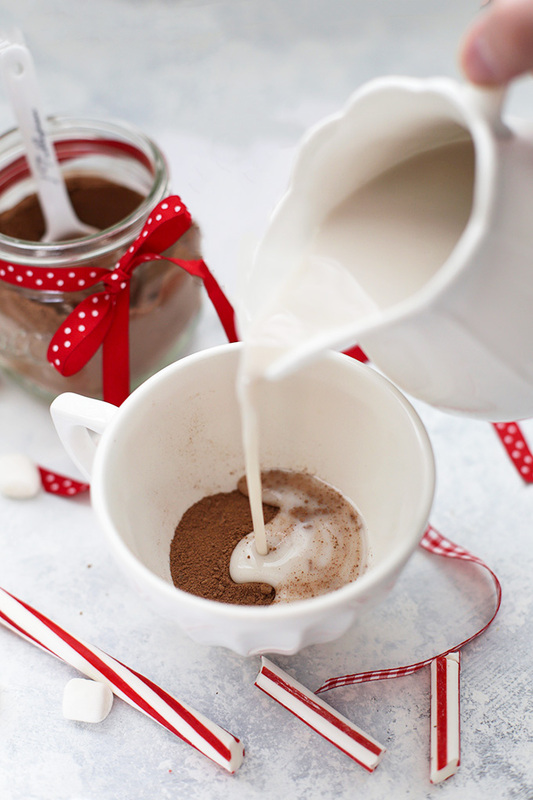 This dairy free hot chocolate makes the coziest cup of cocoa! It’s vegan as is, but for paleo and non-vegan friends, try adding a little bit of collagen for added protein. It’s the best-tasting “protein drink” you’ll ever have! Place chocolate chips, coconut sugar, and cocoa powder into a blender or food processor. If using vanilla powder, add to the blender. If using vanilla bean, scrape out the seeds and add to the blender. If using vanilla extract, do not add to the blender. Puree until mixture is a fine powder. Store dry mix in an airtight container or jar up to 1 month at room temperature or 2 months in the refrigerator. For a single serving, combine 1 1/2 to 2 Tablespoons dry mix with 8-10oz milk (I prefer cashew or almond). If using vanilla extract, add 2-3 drops per serving. Heat on the stovetop in a saucepan or in a mug in the microwave until heated through. Stir or whisk until chocolate is completely melted and combined. 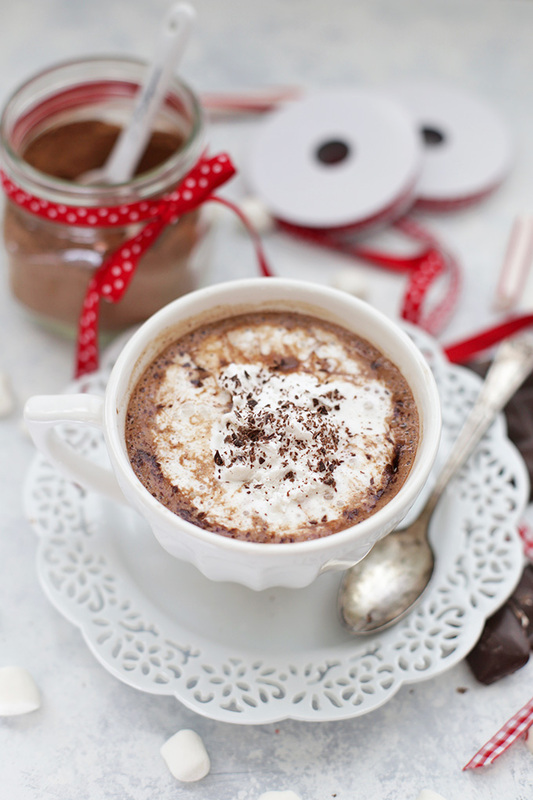 Top with marshmallows, coconut whipped cream, or grated chocolate! My pleasure Shirlene! I hope you LOVE it! How many calories per mug please? 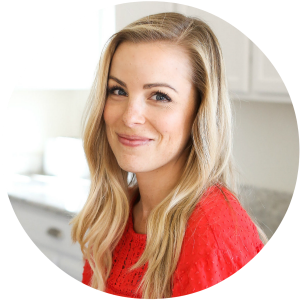 Brenda – I don’t have nutrition facts available on my site yet (hopefully soon! ), but you’re welcome to plug the ingredients into any free online calculator. MyFitnessPal is one of my favorites (the free app or the site). Happy Holidays!